Sometimes the internet is really funny. Part of my job is to keep in touch with what’s important to gaming communities, and to report any newsworthy secrets or scandals unearthed by millions of gamers worldwide. I really like doing this, and it’s only partially because I enjoy looking for news. The rest of what raises a smile over my morning coffee is memes, shitposting, and digital ‘banter’ in all its forms. The Total War subreddit is among the most consistently funny (if occasionally salty) of the many such communities I browse every day. 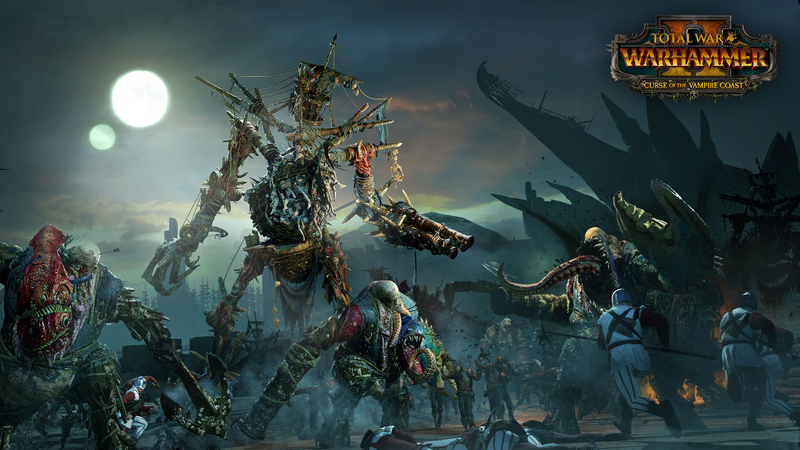 And with the announcement of the Curse of the Vampire Coast DLC for Total War: Warhammer II, its denizens have been on fine form, sending everything up from the inherent absurdity of land-borne pirates to the obvious comedy of crabs. I wanted to gather the best examples of their wit since I don’t have any other way to celebrate it, and our deputy editor Jules has made the terrible mistake of saying yes. 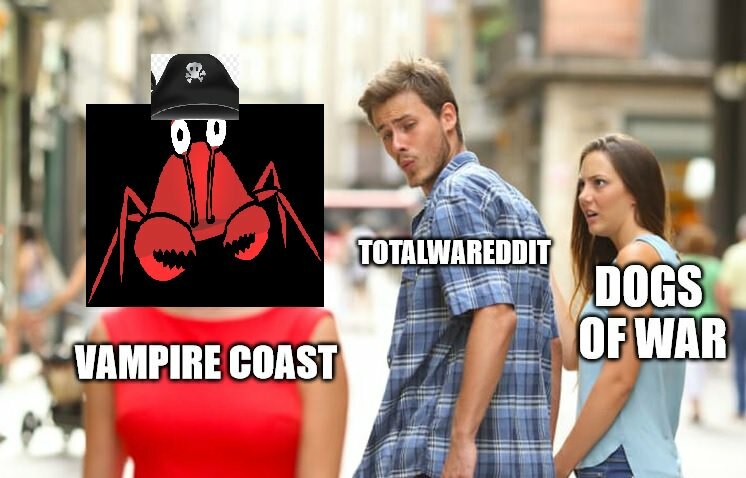 We therefore present herewith the best Vampire Coast shitposts from the Total War subreddit. Here be crabs. For context, traditional ship-to-ship naval battles are not possible in Total Warhammer, and Creative Assembly confirms this isn’t going to change with the Vampire Coast. Instead, two enemies who encounter each other at sea will have the option to fight on local islands, which at least gives you an option other than autoresolving every sea battle. Most-upvoted responder SuspenseSmith points out that the Vampire Coast will release on the same date as the US midterm elections – “Kislev tampering with Elector Count results”, in other words. And Boris Todbringer’s key pledge in the race against Karl Franz? “We’re gonna build a wall, and we’re going to make Chaos pay for it”. GoddyofAus was the OP who slyly noted the community’s rapid acceptance of the Vampire Coast by repurposing this classic meme. Weaponmaster470 was the most-upvoted responder, noting the lamentable lack of crab in Goddy’s post. And it was jasonrodriguez_DT who decided: no, this crabsence shall not stand. Even if I must take an online course in Photoshop, this sub deserves a crab in a red dress. And boy, did Jason deliver. There’s something almost majestically low-effort about this one: pasting in the hat is extra work, true, but it’s also another opportunity to do a crappy job of it. Shame the effect is undermined by the unnecessary drop shadow on the captions in the original meme, which Jason has edited. I’ve spent a little too long on this. It’s Creative Assembly’s custom to release game updates alongside DLC, and DirkDiggy99 has a prediction as to whether or not the Vampire Coast will also come with a patch. 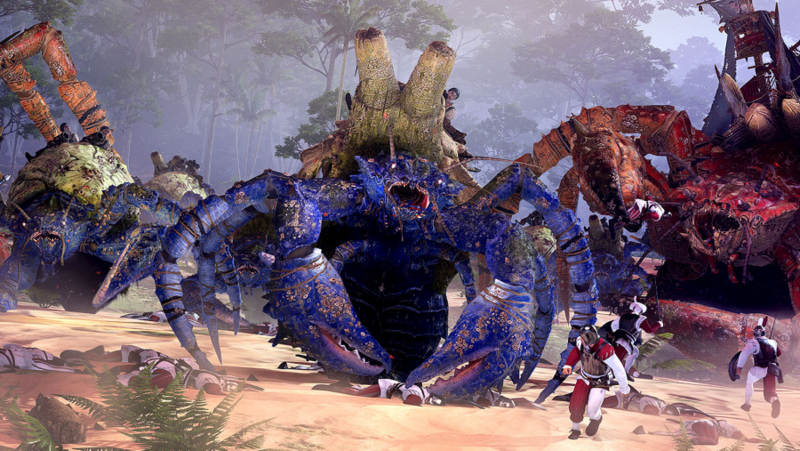 “Giant enemy crab! Attack its weak point for massive damage!” is one of those pointless phrases that we’re all doomed to hear at any moment of passing relevance, along with constant entreaties to “do a barrel roll” and yelling three times about snakes. Perhaps because of this or just because crabs are funny, toblys’s portfolio advice is to invest heavily in crab memes and sell off your Dogs of War memes as quickly as possible.